The Texas Secretary of State’s Office is in the midst of purging voter registration records, ostensibly to clear the files from records of people who might have died, moved or ineligible to vote. Secretary of State David Whitley announced the purge in November, saying that any voter registration that hadn’t been used in two years was subject to removal. His office tagged some 95,000 records that his office claims coincide with Department of Public Safety records for drivers’ licenses or identification cards that show the holders are not U.S. citizens. Only citizens are eligible to vote in this country. County elections officials now are charged with verifying those records. They will try to contact the voters or seek other ways to verify their validity. People have been purged in error in the past, so voters should be diligent regarding their own status. Whitley’s office stated that about 58,000 of the targeted records had been used to vote in at least one election. Historically, however, the verification process has found that improper voting incidents usually were in the single digits. 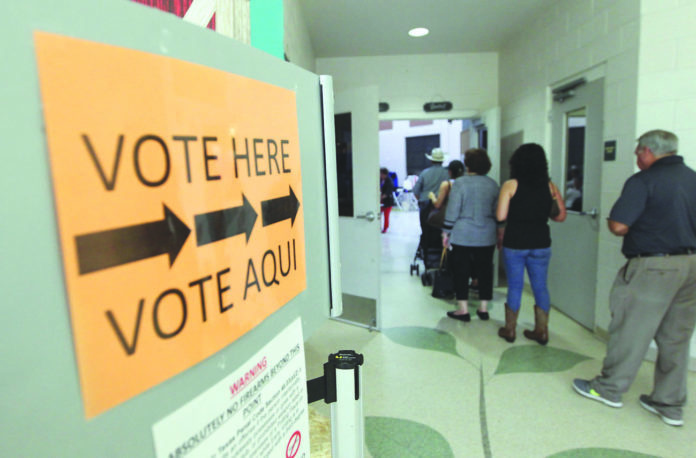 As the process continues, officials and voters alike should keep in mind that those who plan to vote in the May 4 elections must be registered by April 4. It would be a good idea to check to ensure that one is still on the voter rolls before then, in case they have to reapply. Previous purges in Texas and other states have found most of those tagged for possible removal are indeed eligible voters. Some might have moved, some simply hadn’t voted in recent years and some just had names that matched records for other people in the archives of DPS and other agencies. This isn’t the first purge, although the practice wasn’t used much until recent years. Some people allege that it’s a Republican Party effort to reduce the voting population and increase their election chances. But in Texas, voters don’t have to report party affiliation and the only reference linking a voter to a party would be a party primary in which someone voted. That information is used to determine eligibility to vote in primary runoffs. And there’s nothing wrong with periodic updates of voter rolls to ensure they don’t become littered with outdated information, as long as officials do what they can to eliminate problems. Fortunately, that seems to be the case, as this review began after the November national election. A state district judge halted a 2012 purge in Texas because voters removed in error would not have enough time to correct the mistake in time to vote in an upcoming election. This year’s ballots will be dominated by local elections. Congressional, state legislative and other major positions won’t be decided this year, and without party primaries and related runoffs fewer elections will be held. Whether one believes the process is a nefarious plot against voters or an necessary nuisance, the purge is happening. Those who plan to vote might want to check their status in March. Better yet, they should seek legislation that would allow same-day registration, so that any errors discovered on Election Day can be corrected immediately.